A parliamentary report of 1777 recorded workhouses in operation the Winchester parishes of St Mary Callendar [Kalender] (for up to 12 inmates), St Maurice (30), and St Thomas (40). In 1826, the parishes of Micheldever and East Strattion formed a Gilbert Union. The Winchester parishes of St Thomas and St Clement also took this path. Hampshire: Bishops Stoke (2), Chilcombe, Crawley, Easton, East Stratton, Headbourne Worthy, Hunton, Itchen Abbas, Kings Worthy, Littleton, Little St Swithin, Martyrs Worthy, Mitcheldever [Micheldever], Milland (Ville), Morestead, Owslebury, St Bartholomew-Hide, St Faith, St John, St Lawrence, St Mary Kalander [Kalender], St Michael, St Maurice (2), St Peter (Cheesehill), St Peter (Colbrook), St Thomas (2), Sparsholt, Stoke Charity, Twyford (2), Weeke, Winnall, Wonston. The population falling within the union at the 1831 census had been 16,807 with parishes ranging in size from Morestead (population 90) to Winchester St Thomas (1,665). The average annual poor-rate expenditure for the period 1832-35 had been £10,312 or 12s.3d. per head. 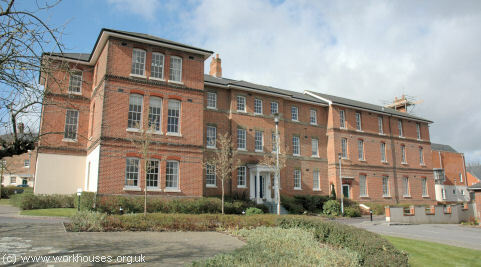 The New Winchester union workhouse was built in 1836-7 on land known as Oram's Arbour to the north-west of the city centre at the west side of Stockbridge Road. The architect is believed to be William Cole whose design was based on the Poor Law Commissioners' model Y-shaped plan. Intended to accommodate 300 inmates, the Commissioners authorized an expenditure of £5,194 on its construction. The site location and layout are shown on the 1871 map below. An infirmary was added at the west of the site in 1845-6, followed by an isolation hospital in 1871. The 1894 map shows that the original pattern of buildings was was already much altered, with the removal of the original perimeter structures. These would have been mostly single-storey utility rooms such as stores and workshops. A recent model of the site also shows the layout of the buildings after the removal of the perimeter. 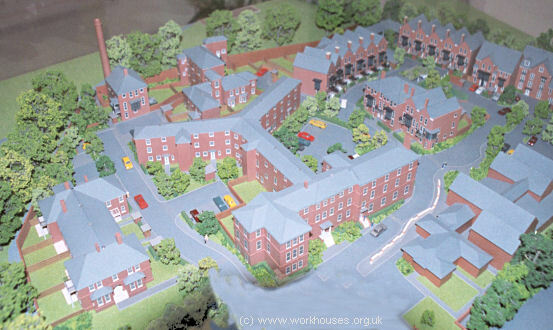 Model of Winchester workhouse buildings as of c.2000. 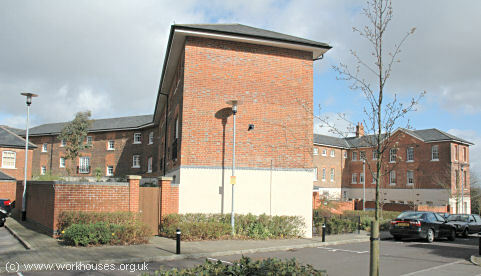 Winchester porter's and casual ward block from the south, 2007. Winchester workhouse entrance block from the east, 2007. Winchester workhouse main block from the south-west, 2007. By 1870, an infirmary had been added at the west of the workhouse. A sanitary annexe at its northern end contained water tank in its windowless upper storey. By the same date, an isolation hospital had been erected at the north-west of the site. 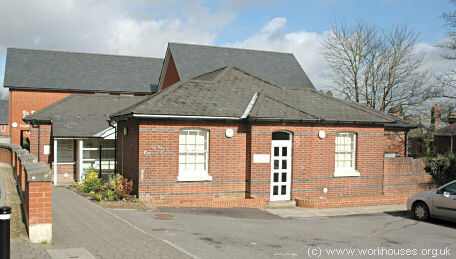 Winchester original infirmary from the north-east, 2007. From 1904, to protect them from disadvantage in later life, the birth certificates for those born in the workhouse gave its address just as 1 St. Pauls Hill, Winchester. In 1912, a large nurses' home was erected at the south of the workhouse. The hospital was used for military purposes during both World Wars, for soldiers convalescing and undergoing minor operations. Between the wars, the name of the hospital, which was originally called The Infirmary, was the subject of a dispute between the medical authorities and a certain Dr Patrick Lowden, who came to the city in 1933. Taking a dislike to the existing name, he decided to rename it St Paul's Hospital after the nearby church. Dr Lowden had the name painted on a sign which he nailed up at the hospital entrance. The medical authorities objected and took it down, but Dr Lowden put it up again. Eventually the authorities let him have his way and the hospital became St Paul's. From 1948, St Paul's provided care for the elderly. More recently, drug and alcohol advisory services and psychological services also used it as a base. 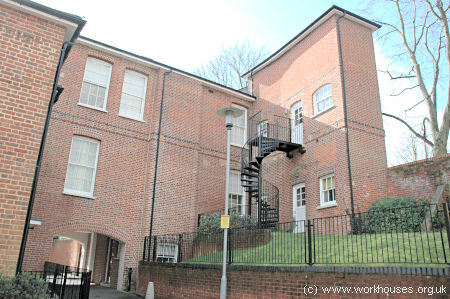 The hospital finally closed in 1998, and has now been converted into residential accommodation in a development called Oram's Mount. From 1880, children from the Winchester Union were accommodated and educated at the Portsea Island Union's children's home. In March, 1927, Winchester opened a pair of children's cottage homes at Nations Hill, Kings Worthy.. The St Nicholas' Home housed up to 15 boys, and the St Margaret's Hoem 15 girls. After 1930, the running of the homes was taken over by Hampshire County Council. The buildings no longer survive. Hampshire Record Office, Sussex Street, Winchester SO23 8TH. Holdings include: Guardians' minute books (1835-46, 1891-25); Birth registers (1835-1931); Death registers (1835-1938); Admission and discharge books (1835-1951).